Kid Pecos with TL Sound Reggae Dancehall working on a set of vinyl. A bit of Dance Opera some smooth sounds into the the 1950’s to up 1980’s this wave main vibe LP’S, dance older tunes 7″ mix into those years. Disco was a big main genre for club dancing. This for a dance set in An Entertainment Area can have the party dancing people in a solid groove of vinyl sounds. @pecossound with items from Jarvis Pecos Flea Market. Pecos Sound System thought do have lots of old VCR Videos from out of the Video like Vinyl scene will try to just place some titles. This Kid Pecos like with lots of books in bulk can ship out a box of Videos, Books any books under subjects of interest that may be around mostly books on Religion, God some more subjects also, Vinyl solid all genre selection. Slightly Easier to ship iyems in bulk. Kid Pecos has a spot to play Pecos Sound for a few sets. Thanks For Promo of fans. Will be adding new selections thoughts some may be in past post while getting sound set to play a mix these replays seem to fit. Vybz Kartel Don’t Dis On Free Willy a Kutchie Love selection. Will be adding a few tunes items from this set. Sort of not the best in focused set You can think of the to be an item with this in your thoughts. Kid Pecos is still on a bit of replay and fill in sound, Like all of the good times gone by. Pecos Sound System still has lots or as they say tons and tons of vinyl to list for the vinyl sell off. Some genres are like the sets shown. So to say the genres. TL Sound Reggae Dancehall has an all genre or years from 1960’s to newer dancehall tunes in vinyl. At http://www.pecossound.com you can see a solid start to some of what the sound can play. Being a sound system Kid Pecos of Pecos Sound System likes having as many selections per dance. Playing more cuts that a music dancer can just trip on wondering what type of tune will drop next. To learn how a DJ, Artist, Sound, Sound System wants their own type of musical mix to be it is good to get into other musical grooves. For Kid Pecos that would be listening to all genre of vinyl, specialty like reggae live plus other musical performances, dancehall events, some Sound System shows. Now with the New Year 2016′ thought be good to add a few specialty reggae labels artist with soul specialty disco dance to mix in with the vinyl sound. Togo with Pecos Jarvis Flea Market just to star some VCR Movies Tape, Book Titles. Kid Pecos plays Pecos Sound System thanks the crew for making it to this years various Sound System Set. Will put some more info on acts, sounds, artist, genres, labels, years that made Pecos Sound System to form the mix of vinyl musical tunes. Early 1980’s based on late 1970’s going back to the late 1950’s just for vinyl from Jamaica W.I. you had Sound Systems, JA labels, recordings of local DJ’S, For what was a Sound System you would have am artist with their own style of vocal for the most part, could include musical solos, dance specials, sound effects POM! POM! General Echo from Jamaica was an artist from Echo Tune Hi-Fi a late 1970’s to early 1980’s Jamaica based Sound System. 1 of the early artist tunes I enjoyed in helping to the reggae vibe in me “Drunken Master” out around 1980′ on with a host of hits for General Echo of Echo Tune Hi-Fi. General Echo with Echo Tone Hi-Fi was creating a younger type of vocals early starting a sound system with a Sharp Chanting DJ like General Echo. With the 1960’s having a Mic Chanter bringing in a tune & mic chants. This wailing sound was starting to be a part of the sound system. Echo Tone Hi-Fi being a Jamaica early 1980’s sound system I did not get to hear or see the sound with what General Echo put on vinyl minus Echo Tone Hi-Fi dancehall sound system set you can hear General Echo style. Into the 1970’s there was some labels, artist a few new some out of the 1960’s creating a new Reaggae sound. Products from labels like Giant with backing studio bands like Impact All Stars later forming Impact! label with most important seems to be the 1 who puts it all together amd get the item out like A Product Of Heavy Sound Jamaica W.I. Kid Pecos plays Pecos Sound around Paraje. For pecossoundsystem the 1980’s with all genre 1970’s some hearing the late 1960’s sounds early 80’s started the reggae journey. With some newer sounds Reggae DJ’s after the great General Echo of Echo Tune Hi=Fi. 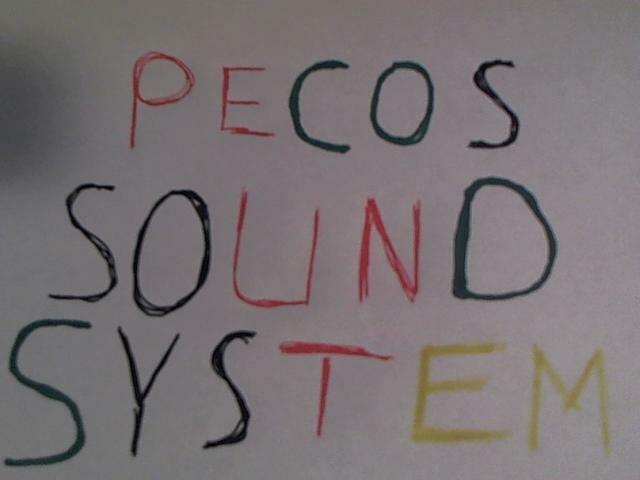 www.twitter.com/@pecossound is now around Paraje New Mexico. TL Sound Reggae Dancehall will be setting up a set with Mars Disco. All crew if you make it with the Blizzard arriving soon check out Mars Disco 1980’s. Randy’s Records a late 1960’s reggae label. This early late Ska, Rock Steady sound system style sound gave some of the early 1970’s artist, labels a chance to put a slightly new changing type of sound. This release features Matador the musical style who shortly after in the early 1970’s would create his own label Matador. Kid Pecos would think it safe to say Matador would have been a 1960’s reggae sound system. Under this name of his sound or label Matador maybe a under other sound names at times sounds sort of change names a bit. The vocals of Bondo Nyah or maybe Bongo Nyah is a young starting DJ U-Roy. U-Roy would go on to become a 1970’s on #1 Roots DJ OR #1 Reggae DJ from this chanting over Matador Sound. For Kid Pecos like with all genre early 1950’s 60’s vinyl the style sound is a nice vibe. Like at Mars Disco 1980’s early 80’s is Pecos Sound Best knowledge expeirence of sound is based on. 1960’s 1970’s reggae sound system vinyl Pecos Sound System is placing out now with the set at Mars Disco 1980’s. Mars Disco 1980’s with a few sounds starting out releasing songs on private labels is what artist would do to promote their music.The Deltones above on Deltones Records. Most genres did this hoping for the most part a major label would pick them up doing the recording selling to the at the time stores that sold vinyl. The artist Kid Pecos would say did a great job on the musical pressing to vinyl 1st cassette tape later. The Dance genre more so in the 1990’s recorded on their labels for the smaller DJ, Sound, collector some in the 1980’s own music label for dance genre. American artist outside of reggae genre Kid Pecos would say did a great jop of putting out their music on vinyl. You can find a solid amount of 1950’s to mostly it seems mid to late 1960’s with a mix of LP’S with special slightly more releases of 7″. 1960’s to late 1980’s more private label LP’S with less 7″. Cassettes mostly 1980’s had some private release for a more regional set of people. Reggae had the sounds that needed lots of tunes for dances, reggae vimyl shows. Some sounds would like Sound Systems to label artist to label are star would go to be labels, stores sellers of reggae items El Paso Sound became a label El Paso Records a record reggae items store El Paso Record store out of Jamaica did lots for recording publishing reggae artist vinyl music.